"So when you want to get a grip... Get the Roto GrippTM"
is by far the best attachment available for the Rail X and any other standard excavator. 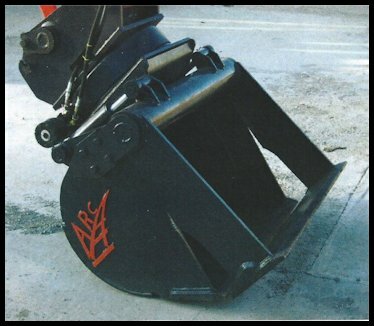 This full 360 degree rotating jaw bucket has the ability to make efficient detailed adjustments in many directions standing still or on the move. Which makes siminsagh clean up between rails, removing slides, fallen trees, grade and clean ditches, remove and replacing rail ties, measure, spread and grade ballast operations done accurate, quick and effectively. "Barely describe the benefits and capabilities of this attachment... This efficient tool is so versatile, one bucket can replace several other attachments." "This One Tool is a must have attachment... for any equipment that uses a bucket " So when you want to get a gripp Get the Roto GrippTM !